Canon EOS 600D / Rebel T3i is currently one of the best entry-level DSLR in the world. T3i is very cheap, price around $400. It was replaced by Canon EOS Rebel T4i in 2012. Today, we are showing you recommended lenses for Canon EOS Rebel T3i. Portrait lenses are very popular lenses for photographers. 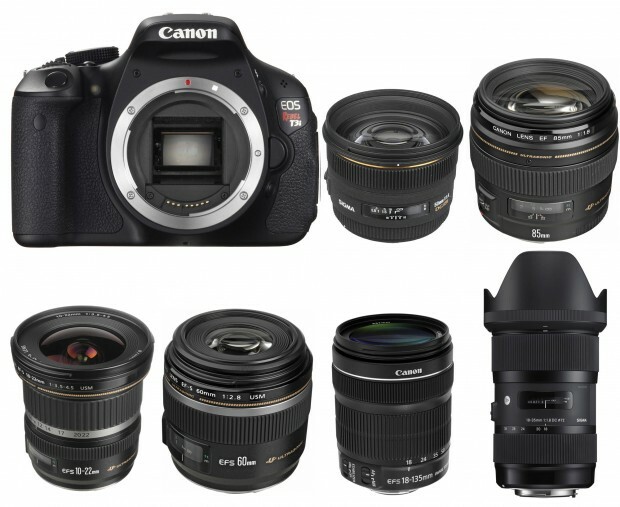 Below are a list of best selling portrait lenses for Canon T3i. The best one fit for T3i is Sigma 85mm f/1.4 EX DG HSM lens. And the EF 100mm f/2 USM is another great lens for T3i with a very cheap price. For zoom lenses for Canon T3i, there are also several choices. The best of these lenses is of course Sigma 18-35mm f/1.8 DC HSM lens. For a low price, you can also try EF-S 18-135mm f/3.5-5.6 IS STM lens. If you are looking for a wide angle lens for Canon T3i. The best choice would be the new Sigma 18-35mm f/1.8 DC HSM, but the price is not very cheap. Another good wide-angle lens is EF-S 10-22mm f/3.5-4.5 USM lens. For prime wide-angle lens, the new Sigma 30mm f/1.4 DC HSM is a great lens for T3i. Here are some recommended Macro lenses for Canon EOS 600D / Rebel T3i, the EF-S 60mm f/2.8, EF 50mm f/2.5 are cheap and good macro lenses, and EF 100mm f/2.8L is have best image quality, but the price is not cheap. If you need a lens around $1,000 for Canon T3i, the best choice is Sigma 18-35mm f/1.8 DC HSM lens.